LONDON & SAN FRANCISCO, Calif. -- StaffConnect, provider of the world's leading enterprise mobile employee engagement platform, today announced the availability of a new eBook entitled, "How to Solve the Employee Engagement Crisis for Not-for-Profit Organizations." 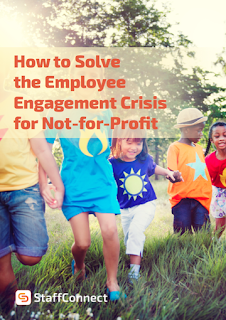 The new eBook explains why employee engagement is critical for today's nonprofit organizations and what issues stand in its way. It goes on to offer immediately actionable advice for how today's nonprofit can inspire the highest levels of employee and volunteer engagement. In doing so, a nonprofit can reach its full potential, including raising increased funding and donations, and attracting the ideal new employees and volunteers, while retaining and improving the productivity and results of its current workforce. Key to enabling this shift for nonprofits, the eBook explains, is technology. To be successful and drive engagement, nonprofits must embrace new mobile-enabled technology that facilitates adoption across the entire, distributed workforce via personalization, an engaging user experience, and a strong feature set that promotes feedback and supports getting the job done faster and smarter. But more than this, nonprofits need to employ technology platforms that allow them to effectively measure engagement, so that they can use this information to make important cultural advances toward improving their workers' experience of the organization. "Today's nonprofits are recognizing that regardless of their 'bottom-line' goals, in many areas they still need to be run like a for-profit business organization if they hope to compete, thrive and survive. For a nonprofit, they are of course competing for funding and donations, to raise visibility in a crowded space, and to attract and retain employees and volunteers. And, once they have their employee and volunteer base in place, they need to ensure optimum engagement, in order to ensure strong retention, productivity and results," said Geraldine Osman, Vice President of Marketing, StaffConnect. "And for nonprofits, just like for-profits, it is absolutely essential to leverage technology as the #1 enabler to make this goal a reality." 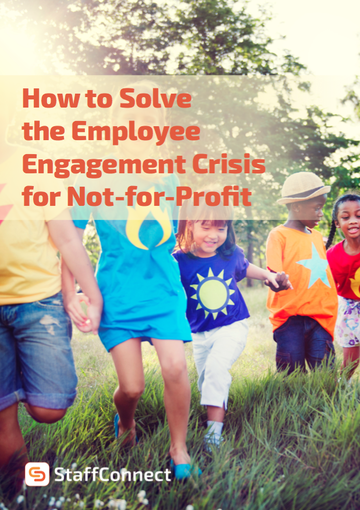 To learn more and read "How to Solve the Employee Engagement Crisis for Not-for-Profit Organizations" please visit: https://www.staffconnectapp.com/how-to-solve-the-employee-engagement-crisis-for-not-for-profit-2/?preview=true.